While one Means End Chain is certainly an interesting view, we want to be able to understand the experience of the offering across multiple test users to see what is working about the offering, what isn't, and areas of potential interest. To do this, we will combine the Means End Chains of test users onto a single view called a Cognitive Map. Cognitive maps are called this because they quite literally end up looking like maps, and are designed to illuminate pathways of thinking from one concept to another, as well as highlight those areas which are more commonly traveled. For the sake of providing a picturable example for us to work with, let's say the offering is a new native grass seed your company has identified which is extremely drought tolerant, low growing, and low maintenance. At this point, you have interviewed ten users whom you sent the seed to last year, and they have now used and lived with the lawn for a full four seasons. 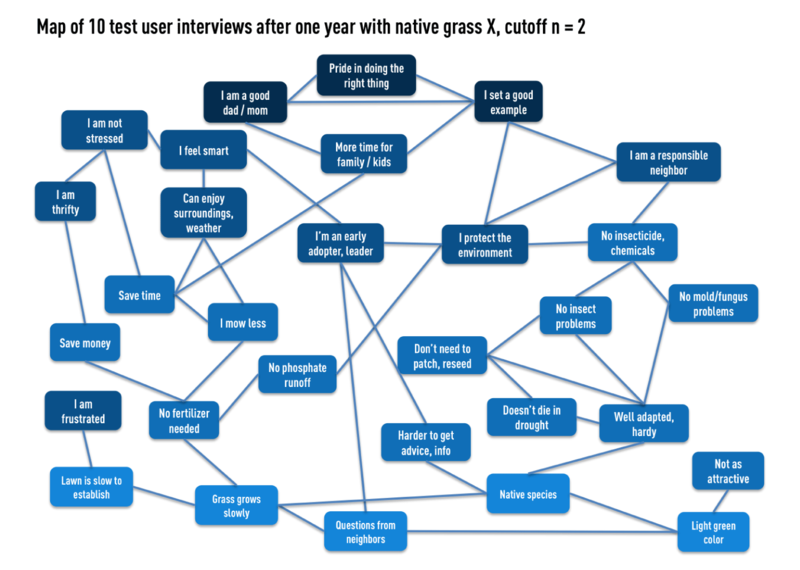 You had done some other, shorter user testing with the grass seed that spanned either a single season, and invited testers to a lawn which had already been planted with the seed to understand their thoughts, and the results had been promising, but it is the full-year test cycle which you believe is most interesting–and crucial–to the potential success of the new seed offering. We will imagine you are relying not only on your notes taken during the interviews, but also audio recordings (or, even better, transcripts from those recordings). We will start by writing down the MECs used by one participant, and for simplicity and readability, we'll try to keep attributes near the bottom of the page, and emotional ends near the top. We'll use lines to not only connect the chains, but also between concepts the participant associated so we don't have to write the same attribute multiple times. Here's an example of what a very simple map from one of those participants could look like. Take a few moments to look at the map without the red text, and then take a look at the layer with red text to see what the participant verbatims might look like for each link. Simple map includes the following statements: I am a good dad. I am a responsible neighbor. No watering. More time for kids, family. No chemicals on lawn. Doesn't die in drought. Don't have to mow as much. No fertilizer needed. Native species. Grass grows slowly. Expanded map with potential participant verbatims includes: "I feel like I'm doing my job as a dad when I can take those nice days to play instead of mowing." "A good dad should be a good neighbor." "I'm not the 'jerk' neighbor who waters for 5 hours a day during a water restriction." "I feel like a good dad when we can roll around and I know I'm not hurting anything." "I'm doing my part for the neighborhood by not putting phosphorous in the rainwater." "I have more time to play with the kids because I'm not mowing every 3 days." "I don't have to mow that week of crazy growth from fertilizer." "I don't need to put all of the artificial nitrogen on the grass." "I don't have to mow as often because the grass is slow growing." "Because it doesn't dry out, I don't have to water it." "Because it doesn't grow quickly, I don't need to fertilize." "Because it's a native, you don't have to fight to keep it alive with fertilizers." "It doesn't die off in summer because it's here naturally." As you work through mapping, remember that it is the participant's MEC and thoughts we are mapping... NOT yours. So if they make associations that are "wrong" or don't mention something, don't make the associations for them. In the above example, even though there could be a link between "native species" and "grass grows slowly," we didn't add it because the participant didn't make that connection. This is important because by adding in your own knowledge and "over-mapping," you would be skewing the overall picture. After compiling the cognitive maps for each participant, we have a deep, but still somewhat unpolished view of the information. This is because we will have the knowledge from taking a very rigorous approach to the interviews and understanding their content, but yet we do not yet have a fully formed analysis showing the consensus across participants. This view will be provided by the overall map, which is also sometimes referred to as a "hierarchical value map." Without specialized programs, the easiest way to create the final map is to "standardize" similar concepts and enter each linkage into Excel. The purpose of standardization is to make sure we don't have two different names for the same concept in different maps (e.g., "Native species" in one map and "Species that are native" in another), and to allow us a final chance to refine or collapse our list of concepts. After we have the final list of concepts, it is a matter of putting each pair into Excel and keeping a tally of the number of times participants connect the two concepts. For example, we would have "Native species" in Column A and "Doesn't die in drought" in Column B, and we would keep count of the times we see that connection in the individual maps in Column C.
From here, it is a matter of setting a threshold for those concepts and linkages that will make it to the overall map. If we sort the linkages from most common to least common, we would probably look to eliminate the bottom 10% or so from a map covering ten participants, or otherwise to try to eliminate those concepts which are outliers. From here, you are left with a list of the concepts and linkages for the final, overall map, and it is a matter or redrawing the map from this list, perhaps also noting the number of times a linkage or concept was mentioned by participants. 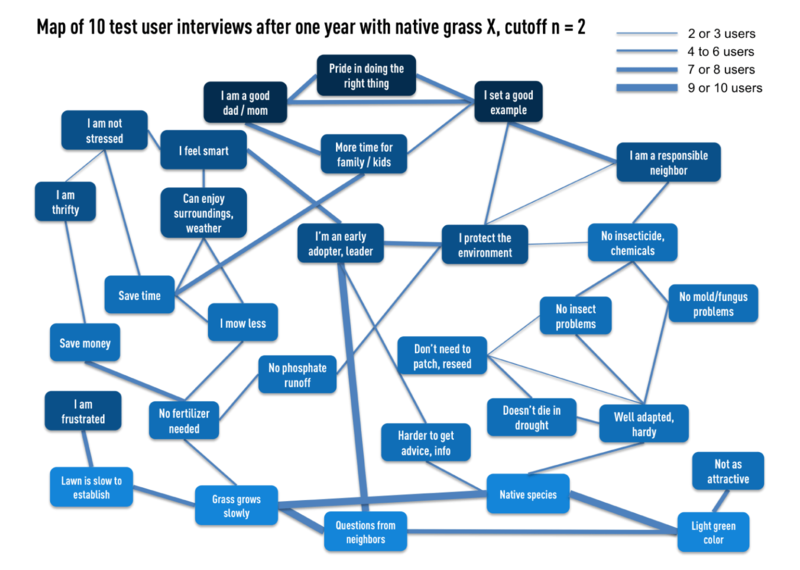 Map of 10 user interviews after one year with native grass includes the following statements: I am a good dad/mom. Pride in doing the right thing. I set a good example. I am not stressed. I feel smart. More time for family/kids. I am a responsible neighbor. I am thrifty. Can enjoy surroundings, weather. I'm an early adopter, leader. I protect the environment. No insecticide, chemicals. Save time. Save money. I mow less. No phosphate, runoff. Don't need to patch, reseed. No insect problems. No mold/fungus problems. I am frustrated. No fertilizer needed. Harder to get advice, info. Doesn't die in drought. Well adapted, hardy. Not as attractive. Lawn is slow to establish. Grass grows steadily. Questions from neighbors. Native species. Light green color. While it does take some effort, the overall map is a valuable tool to provide a deep, rigorous, and yet, simple view of our ten test participants and their thoughts and feelings about the native turfgrass. You will find that the overall map also provides a very valid basis from which to compare future revisions of the offering, definitively showing how your revisions have affected the deep perceptions and associations held by customers. The value of mapping does not end there, as we may also use the map as a strategic framework to drive further ideation, as we will see in our next topic.